A new study has revealed that over 24,000 people will be flying home to Yorkshire in time for Christmas. The study from Buyagift used worldwide aviation data to reveal exactly how many people will be flying into the UK in time for Christmas between the dates of December 21 and 25. Over this time, 11,023 flights are currently scheduled to be heading to the UK carrying 1.8 million people. Of those, 24,812 are heading straight for Yorkshire. Leeds Bradford Airport is the busiest in the region with 17,268 people scheduled to land and 17,188 to be depart. Doncaster/Sheffield will see 6,465 people landing on Yorkshire soil just before Christmas. Looking at the dates, December 21 will be the busiest day with 53 flights scheduled to be arriving. Leeds Bradford is number 582 on the worlds busiest airport at Christmas list as Beijing International tops it with 843,700 people scheduled to be flying in. 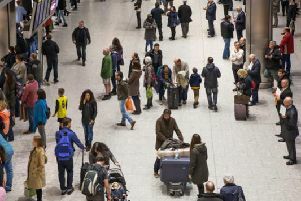 Overall, 10,888 flights to the UK are scheduled between December 21 and 25 with 8,163 of those coming in from international countries predominately Spain, the USA and Germany. Worldwide, 466,897 flights are scheduled to be in the skies taking nearly 70 million people home to their familes. When breaking this down by dates, the eve of Christmas Eve is the busiest day with 99,948 flights transporting 15,000,927 passengers worldwide. Christmas Eve see’s 13.7 million travelling in the sky and even Christmas Day is almost as hectic. To show you what this looks like, experts at Buyagift have gathered the details of all 466,897 scheduled flights from 450 airports around the world and mapped this out across a 5-day animated time-lapse at www.buyagift.co.uk. Dan Mountain, CEO at Buyagift, said: "We understand giving loved ones something special at Christmas is an essential part of the festive season but spending time with our nearest and dearest is priceless. "We wanted to visualise just how important this is around the world, showing just what the sky will look like 5 days head of Christmas as everyone heads home to be with their loved ones for the most magical time of the year."